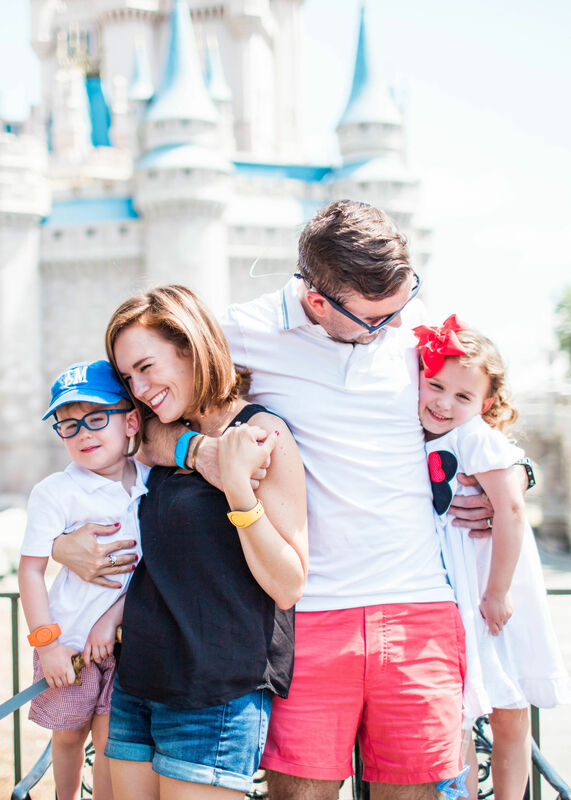 For Christmas we surprised the kids with a Disney trip…and then asked them to patiently wait 3 months to go. We promised them it would be worth the wait — and it so was! And honestly, this couldn’t have come at a better time. We desperately needed a fun reason to head home to Orlando. Desperately. We spent the first few days at my parents’ house and I’m not going to lie — it was freaking tough. I cried a lot, Thomas asked for Grandpa a few times and accepting our new reality that dad wasn’t going to walk around the corner or squeeze me before I headed to bed each night sucked. So having our park days to look forward to was absolutely wonderful. And mom even joined us for one of them which was good for us all. 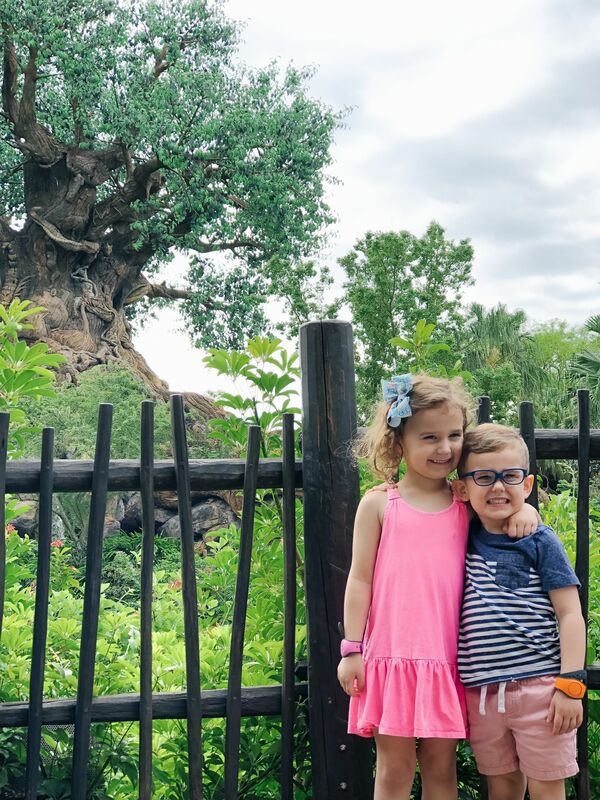 A surprise to all of us, the kids said their favorite Disney park was Animal Kingdom! Our day here was so perfectly mapped out that we were able to tackle almost everything on our list despite the wall to wall spring break crowds. We knocked out the safari bright and early because we heard the animals were the liveliest at this time of day — from giraffes to lions, we saw them all! 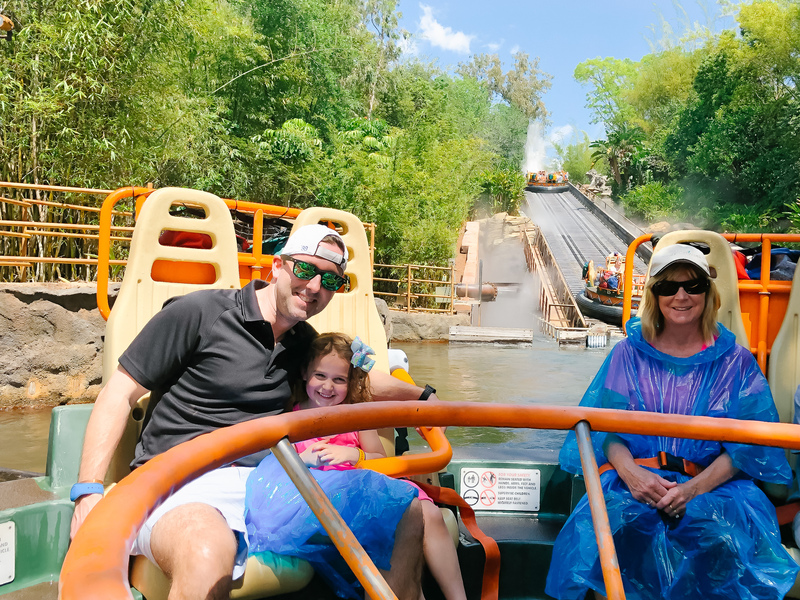 We also rode the Tricera Top Spin, Navi River Journey, Avatar Flight of Passage and everyone’s favorite — Kali River Rapids!!! The kids were ecstatic to meet Minnie & Mickey and get their autographs at the Adventures Outpost. We also squeezed in a few shows to rest our feet — It’s Tough To Be A Bug (which everyone loved so much — absolutely hilarious!!!!) and Finding Nemo which was adorable. And of course, lots and lots of treats from ice cream to popcorn. We decided to stay on property at Disney All Star Movies in between park days which not only allowed us to book our fast passes 60 days out, it made the logistics so much easier! 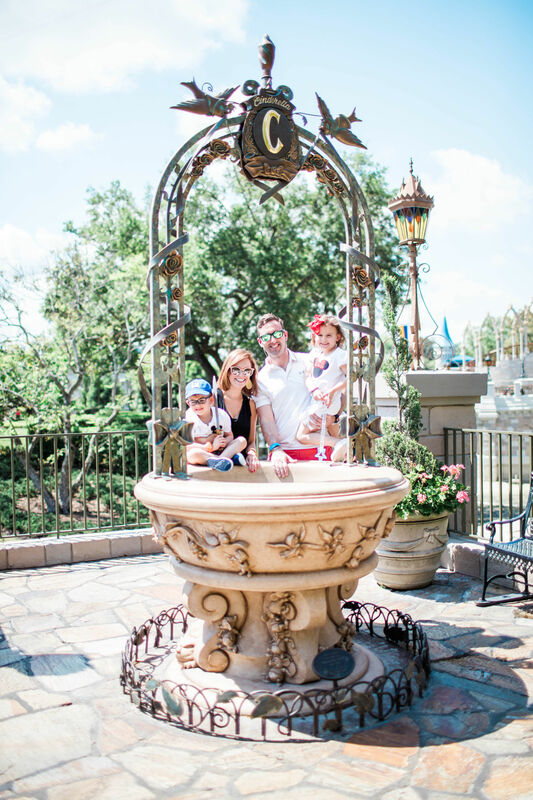 We kicked off the next day with breakfast at Cinderella’s Royal Table. 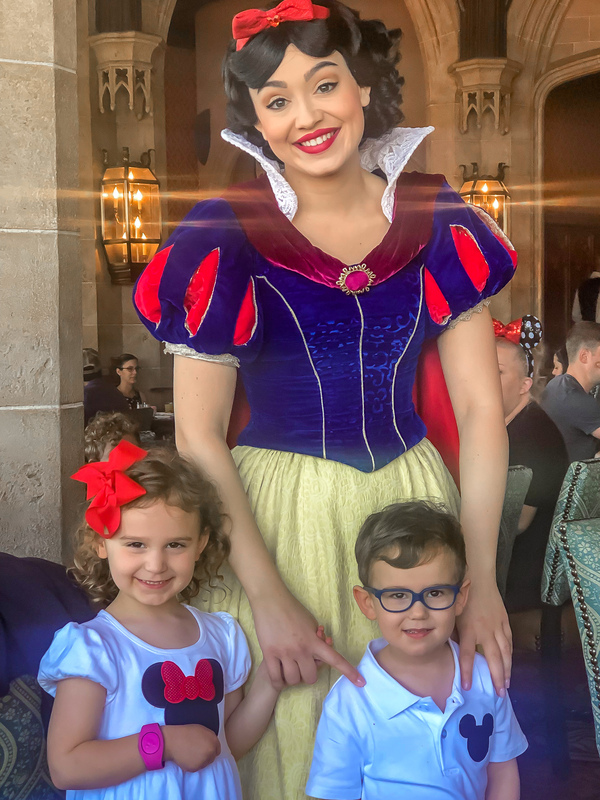 I initially had some heartburn over the cost of this experience but can honestly say it was worth it to see the magic come to life for Caroline. 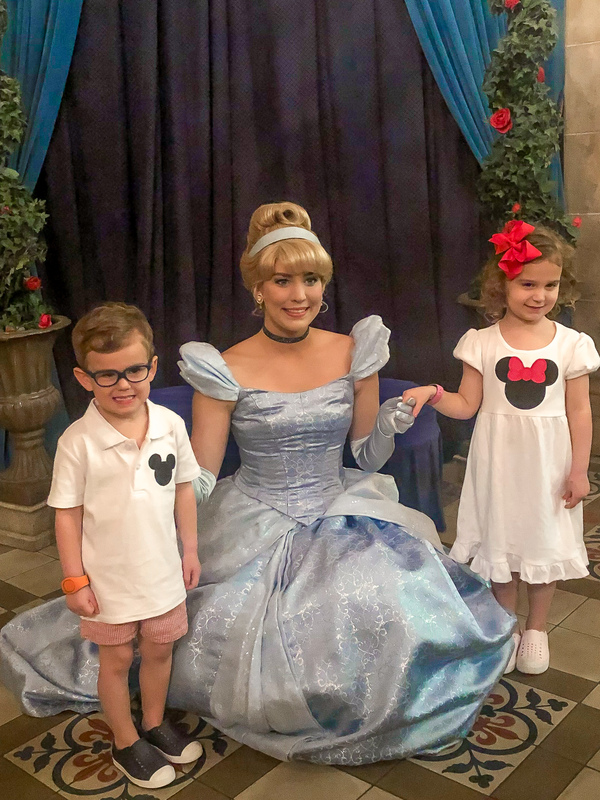 She was in absolute awe to be inside Cinderella’s castle meeting the princesses. It was also SO nice not to have it wait in any lines the rest of the day for princess autographs! After breakfast we rode the Jungle Cruise, It’s A Small World, Voyage of the Little Mermaid, Peter Pan’s Flight, Barnstormer (one of our favorite rides!! ), watched Mickey’s Philharmagic Show and saved the best ride for last — 7 Dwarf Mine Train! 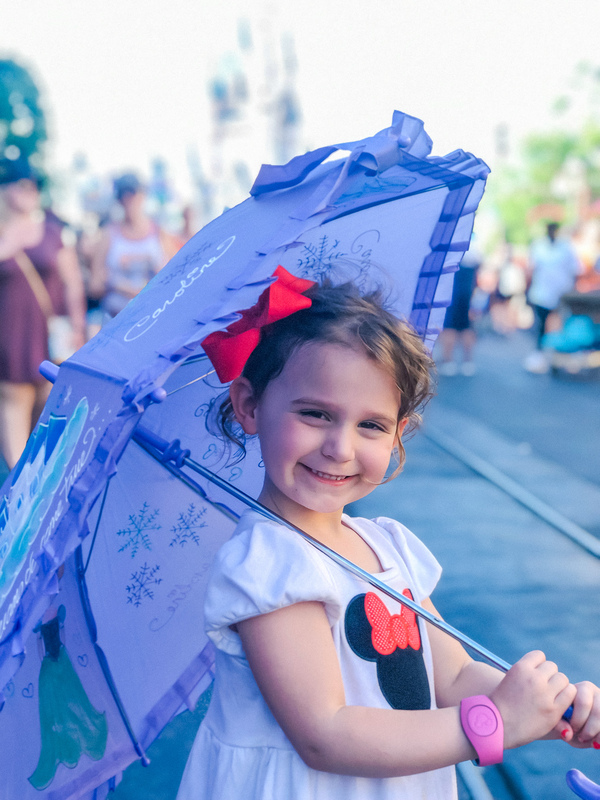 Despite receiving so many glowing recommendations on purchasing the Memory Maker photo pass, we ultimately decided against it because we didn’t want to make standing in more lines throughout the day for photos a priority. 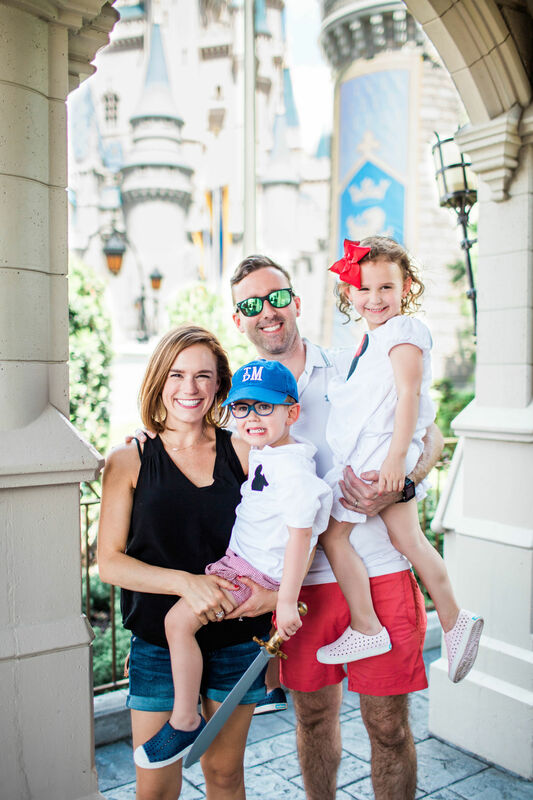 Instead we met Faison in front of the castle in between rides for a 15 minute mini session. Lucky for us they had just roped off the castle for a parade so we got our shots without the crowds behind us. 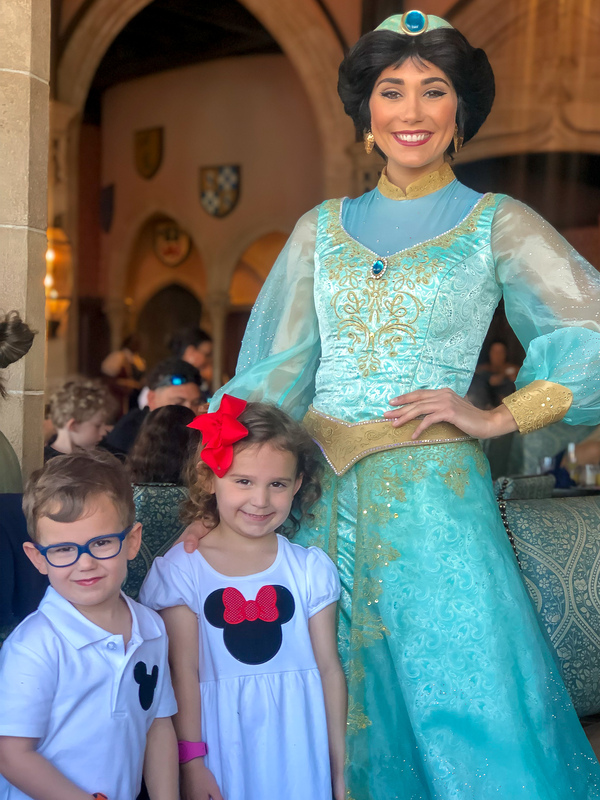 I was so impressed with how many hours the kids lasted at Magic Kingdom, considering we sat in some lines for close to 90 minutes (thank goodness for fast passes and ice cream)! We wrapped up the day by letting the kids pick out souvenirs on the way out of the park. It was a surprise to no one that Thomas picked out a lightsaber and Caroline blew her budget with a hand painted personalized umbrella. The day at Magic Kingdom was unbelievably fun and I’m so thankful for all of the memories we made on this trip! I’m not going to pretend to be a Disney expert because I am totally not! 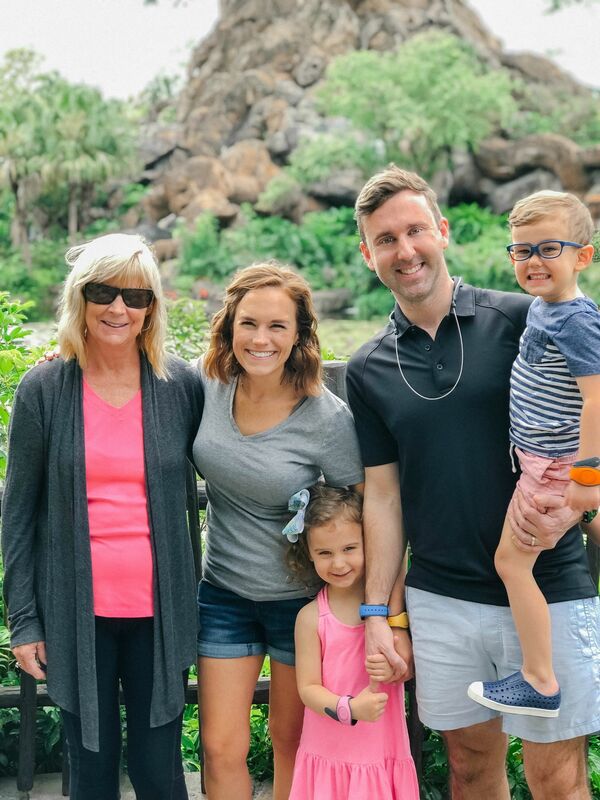 But as promised, I will share the top 10 tips I received from all of my expert readers that helped make our trip awesome. The park opens earlier than stated so get there as early as you can! Also check for extra magic hours. Tag your stroller to differentiate it in a sea of strollers. You should count on your stroller getting moved a lot and having to hunt for it. We tied some pink paper flags to our stroller to make it stand out. Glow sticks are also good for night time! Connect to Disney wi-fi as soon as you get into the park to preserve battery and bring a portable phone charger to charge on the go. Bring in a cooler filled with water, snacks and lunch! Even though we made stops for popcorn and ice cream, we brought in tons and tons of snacks (granola bars, cuties, peanut butter crackers and more). Bonus points if you can find Disney branded snacks! We also brought in Publix subs, lunchables and uncrustables for lunch. And lollipops for waiting in line! You can tear the gray part off the Magic Bands to make them tighter around smaller wrists. Bring ponchos for when it rains to avoid buying overpriced ponchos in the park. Make sure to bring extra to cover your stroller too. These also came in handy for Kali River Rapids ride in Animal Kingdom! The photographers in the park will gladly take pictures with your phone for you! Memory Maker was also highly recommended if you are going to be at the parks for an extended period of time and you commit to stopping at photo stations to get your picture taken. Bring autograph books and clickable sharpies! Pack two bags — one that stays in the stroller and a smaller one that goes with you on rides. Don’t forget sunscreen, snacks, waters, phone charger, etc. Use a Disney planner to plan your trip! 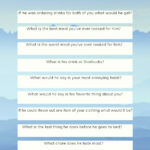 Next Post How Well Do You Know Your Man? Hi! Thanks so much fun for all the details. What did you think of the All Star Movie hotel? We were thinking of staying there this summer and would appreciate any thoughts you have on it! Thanks so much!! It’s a “value” resort so there are no bells and whistles. If you are planning just to sleep there, it’s perfect. If you’re going to be spending time relaxing at the hotel, then I’d upgrade to another resort with a nicer pool to hang out by. Or if you’re doing a lot of park days in a row, I would look into a resort with monorail access (but those are pricey, IMO!). I never went to Disney as a child and actually went for the first time last February and on a fully adult trip, we all loved Animal Kingdom, too! It looks like you all had such blast! We went the beginning of March, I already want to go back! I had no idea Disney had wi-fi?!?!?! Also, we didn’t know about the gray part coming off the kids band until our last day. It would have saved a lot of time fooling with the band on my 4 year old. I’m so glad you guys had a wonderful trip! I can’t imagine how tough it was being home for the first time since your dad passed — my heart goes out to you. But I’m sure making those memories with your mom and your sweet family was a little healing. 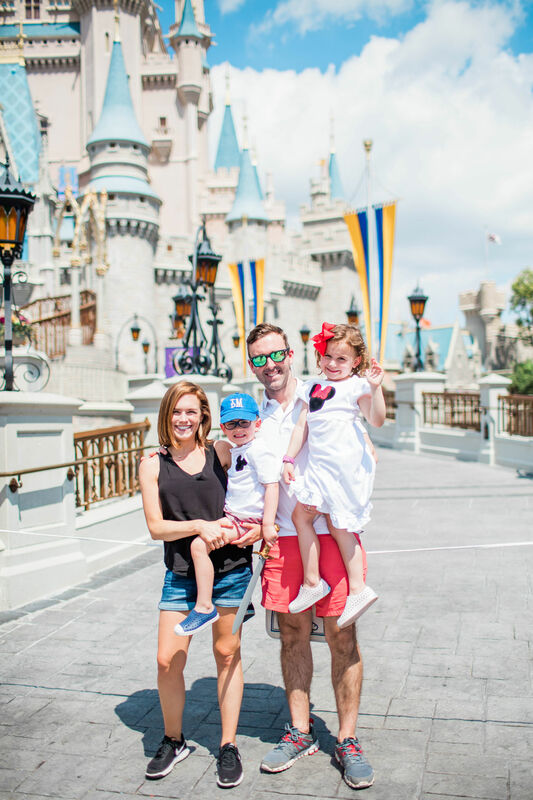 <3 Thanks for the Disney tips — bookmarking this for when we tackle Disney in a couple of years! So fun! Love all of the pictures. Where did you get your shorts? Where did you find Thomas’ cute monogrammed hat? My son needs one! Don’t take loose ice anymore! They just readjusted their rules. You’ll have to put your ice in a Ziploc bag now. thank you for sharing!!! good to know!